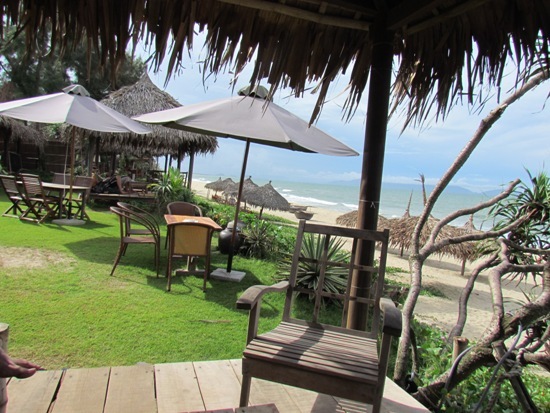 Located on An Bang Beach, Soul Kitchen is facing the sea and offers you a real haven of peace. Indulge yourself and spend your day lying on a large sofa savouring a sweet Mama Feelgood or a boosty Caipi’punch. View the sea and go for an invigorating swim followed by a siesta in the shade of a parasol on the sandy beach. Entertain yourself and let the melodious sound of the waves and the cool breeze feed your body and soul. The restaurant and bar is set up on a flat grassy area with lounge chairs and long wooden tables. Their menu is an eclectic one with a French flare using local seafood and ingredients to create fresh seaside dishes. Whether you are dining, snacking or just drinking, Soul Kitchen is a great place to relax and unwind. They charge a bit more then some other restaurants, but the place itself makes up for it. This place is down the end past other restaurants & well worth the visit. It has it's own parking area for bikes & scooters, so ignore the other multiple parking touts who will try to get you to park in their area. There was large grass areas for the kids to run around, great food and a live band. Don't miss the rice fields on the way to the beach. Sampled much of the menu: grilled prawns, clams, calamari, scallops, beef skewers, beef fillet, pork chops. Most were spectacular. What wasn't was still more than acceptable. Good grub. Awesome food, great live music in the evening, what an amazing spot!!! Food OK but the ginger mojito good, live music excellent. 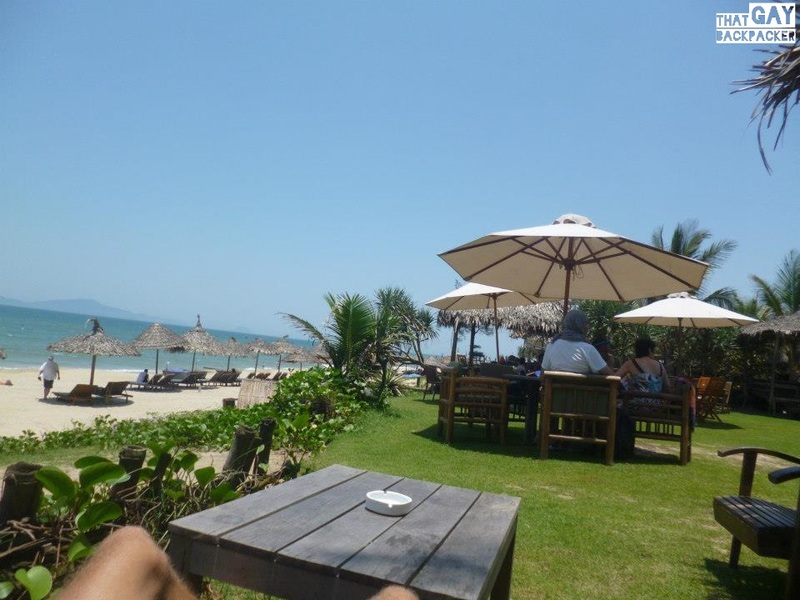 This is a great beach bar/restaurant with it's own swimming area at An Bang Beach. It is a relaxing change of pace, with lots of different seating options - chairs, couches, day beds The food was great, beer nice &amp; cold. It has live music in the evenings. Not cramped, feels private from other restaurants. You do have to go past &quot;touts&quot; from other restaurants wanting you go in to them. This place is down the end past other restaurants &amp; well worth the visit. It has it's own parking area for bikes &amp; scooters, so ignore the other multiple parking touts who will try to get you to park in their area. Ignore their whistle blowing &amp; hand gestures wanting you to park where they tell you to. The place is fine. Has a nice grassing area overlooking the ocean. I guess if you need a hamburger it might be a good place to go but you are in Hoi An. Home of beautiful rice fields, the wonderful old town and great food. Why would you need to escape all of that for a place selling western food that is nearly as good as home. It's a pretty place like all of the surrounding places on An Bang Beach. The bar settings is very nice with some stairs leading directly on the beach. If you go during the day you can easily tan (probably doesn't apply to the Vietnamese people) or you can chill out in one of the palm leafs covered huts. Live music on selected evenings, but bands are not always good. In fact some of them truly sucked, but others were decent. Food is good and cocktail selection and quality is great, but it is a little pricy and you always need to wait for a long time if you don't go to the bar yourself. However, definitely go there for the atmosphere and great location. This is a great beach bar/restaurant with it's own swimming area at An Bang Beach. It is a relaxing change of pace, with lots of different seating options - chairs, couches, day beds The food was great, beer nice & cold. It has live music in the evenings. Not cramped, feels private from other restaurants. You do have to go past "touts" from other restaurants wanting you go in to them. This place is down the end past other restaurants & well worth the visit. It has it's own parking area for bikes & scooters, so ignore the other multiple parking touts who will try to get you to park in their area. Ignore their whistle blowing & hand gestures wanting you to park where they tell you to.